This graceful scrolled stair rail is beautiful the way the scrolls are attached to the stair treads with smaller scrolls, and the way the decorative volute sits on the starter tread. .. This is a spectacular display of romance. The handrail was built with extreme measures and turned with equal precision into the 4 barrel volutes with this dual curved staircase fit for the grandest statement. The silver ribbon and leaves were woven around the black scrolls and frame giving the silver handrail the perfect balance. .. 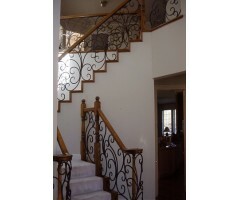 This large curved balcony rail is perfectly balanced with three panels filled with sweeping scrolls, and the center panel proudly displays a beautiful medallion. Each of the three panels have scrolled legs and a centered top scroll for design interest. .. 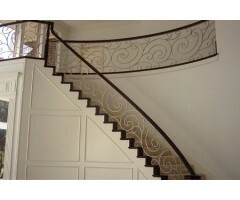 Decorative scroll and leaf stair rail. 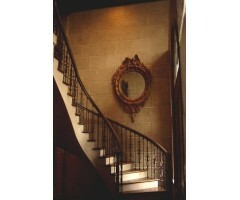 ..
Luxurious scroll design with large leaf accents create a big impact on this entryway. .. 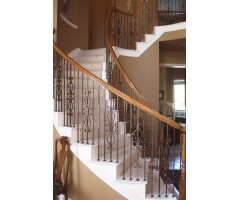 This beautiful curved stair supports 4 balusters per outside tread alternating between twisted bar and a decorative design every 4th bar creating balance and beauty with a wood handrail. .. This unique design was created with a slightly smaller scroll within another alternating between a uniquely shape with a centered solid diamond shape. .. 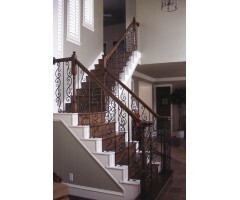 The wood handrail on this alternate iron baluster design is very appealing on this elliptical stair. ..
By using this multi stacked scroll baluster connected to the single bar on either side, we were able to refrain from a bottom bar and attach the single balusters to the treads. 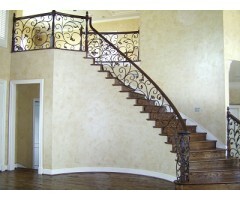 This created a beautiful first impression for this home. .. The designer on this home was in tune with the impact that architectural details make when creating a statement with a whisper. The shadows from using cream on cream for not only the stair rail but also the trim details on the walls was an oppulent tasteful effect! ..
Grand Staircase with scrolls set directly on the treads, and accented beautifully with the wonderful combination of the wood handrail. .. This grand entrance with the expansive balcony rail above the open foyer and the stair rail leading up to it makes a huge impression of elegance with the large leaf tipped scrolls framed and topped with a wood handrail to coordinate with the wood newel posts. ..